A beautiful story on constantly upgrading our skills. 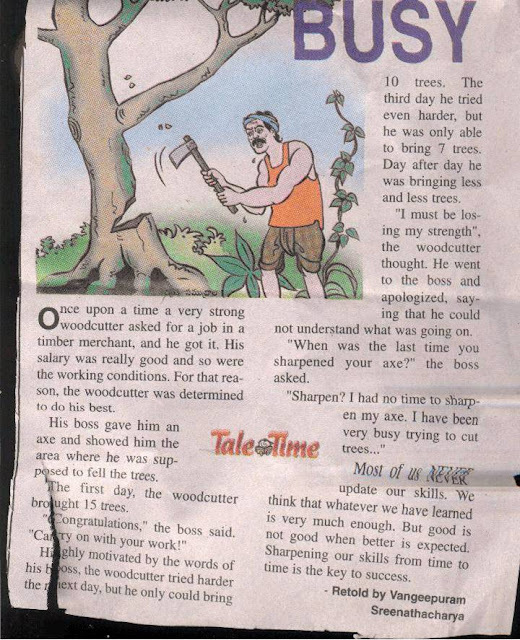 We must continuously sharpen our axe of knowledge, skill and expertise. Sometime we are too busy in doing our routine work that we don’t get time to increase our knowledge. We don’t get ourselves equipped with latest and emerging technologies in the market which are changing the world. At Octaware, we strive hard and always make effort to provide the opportunity and platform to enhance your skill sets on Microsoft technologies (.NET development, MS CRM, MS AXAPTA and MS SharePoint 2010) and encourage certification in the respective technologies. Nice story...and it defniitely works, thanks for the blog.